Sign-up now open for expert review of AR5 (second order draft) | Watts Up With That? I’ll be signing up because I want to see if the second order draft has been modified in response to my thorough documentation of omitted variable fraud in the first order draft (“Vast evidence for solar climate driver rates one oblique sentence in AR5“). The application is simple. It just asks for publications (I cite the blog posts I have written on my area of interest), and a brief statement of expertise (they don’t warn you, but this gets truncated at 750 characters). Not sure if there is a sign-up deadline other than the closing of the comment window at the end of November. They only say that passwords will be sent out on October 5th. Could be you have to sign up before that. Good luck. securely to sod.ipcc.unibe.ch, but we can’t confirm that your connection is secure. Why do they put “Lost in the desert” on the front of their document? Is that an implication of where they’re at, or where they want reviewers to be? It gives me no assurance that the results will be worth reading. >> an Expert Reviewer on the chapter(s) indicated. Problem solved. I had to use IE to visit the site. 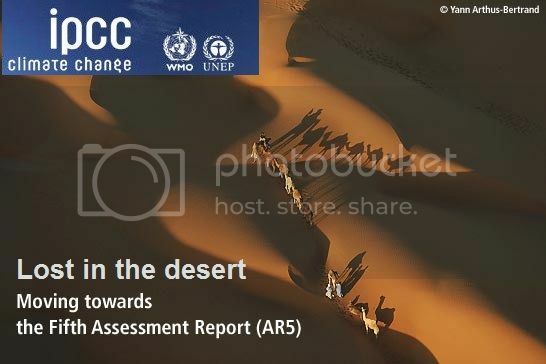 The “lost in the desert” phrase is my addition to the original IPCC image (click the image for the original source). Hey, glad somebody noticed my little joke! Peter Wadhams, professor of ocean physics at Cambridge University, said both potential solutions had inherent dangers but were now vital as time was running out. “It is very, very depressing that politicians and the public are attuned to the threat of climate change even less than they were 20 years ago when Margaret Thatcher sounded the alarm. CO2 levels are rising at a faster than exponential rate, and yet politicians only want to take utterly trivial steps such as banning plastic bags and building a few windfarms,” he said. Here’s hoping for quick death to all of the hapless AR5 ‘Inductees’ on their ‘Bataan March’ into Madness. How very apt and descriptive of the ‘CAGW save the planet by destroying our modern industrial civilisation scam’. Our leaders are literally leading us all into the economic desert by promising us that over the next dune a paradise on earth will magically appear. Follow us comes the cry from our leaders, trust us to lead you to a new promised land, the sacrifices you make on the way will be handsomely rewarded when the promised land is reached. In reality you can imagine our leaders taking us on a trek to thin out the herd. And the further we go into the desert, the more effort will be required to carry on and the less likely it is that we will be able to retreat because the effort to retreat becomes less attractive and more painful in the short term. And that is the essence of the fraud of the modern age, the cult of CAGW that urges us to take so much on trust, that our leaders are gifted with a knowledge beyond us, that they have a sight into the future superior to our own. We have been lied to and deceived and manipulated on a scale never before seen. We truly are being led into a desert and the oblivion that awaits anyone stupid enough to enter and its no less suicidal than joining a cult like heavens gate. I have served as IPCC Expert Reviewer but I won’t bother this time. It seems that a UN FCCC nation’s agency does not need to nominate Expert Reviewers this time. The US NOAA nominated me as an Expert Reviewer for the AR4 and I accepted the nomination then did the job. But no notice was taken of any of my review comments. So, when the IPCC Chairman asked me to review the Synthesis Report I did not bother. And I won’t bother this time: it merely adds to the X number of scientists the IPCC claims were involved in preparation of the Report. Get out there and keep ’em honest, folks, and good reviewing. I wonder a report from an organisation that relies on AGW for its very existence is going to say about AGW ? Sod IPCC? That’s a link that everyone should go to. Lets just hope that a few Glaciologists review it….none clearly did last time…. “Himalayan Glaciers could vanish by 2035” Um , no they could not. Who said they could ( oh thats right the WWF made that up out of thin air ) and where were the “reviewers” to spot this…… or…… maybe there WERE loads of reviewers who said that was wrong but were ignored !? I for one am looking forward to seeing how they intend to massage the Cape Verde Hurricane statistics and trends to make it seem like the exact opposite of what we are observing is actually happening….. That is going to take some spinning but I am sure they can pull it off….. This confirms my suspicions – all of them. I have been watching the trophospheric hot spot argument because it is a core element of the static atmosphere GHG theory of “radiative physics”. The radiosonde data do not support the theory. There is no need to make long presentations about it as an expert reviewer if the fix is already in. Rumor has it the data has been “homogenised” until it confessed there might be some warming but further research is needed to know for sure. 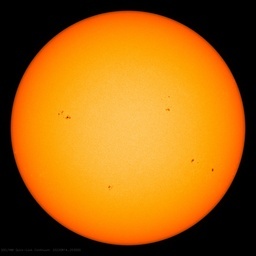 In other words there is no warming. You may recall the phalanx of warmistas who showed up here to dispute with me this missing signature of GHG warming. It is a very sore spot, not a hot spot. As is very nicely pointed out above, if the tropical hot spot prediction has been replaced with ‘polar amplification’ and the Arctic heating represents “20 years” worth of CO2, then the forcing has been greatly overestimated by the IPCC. Now that we have confirmation of accumulating Antarctic ice mass and basically flat temperatures since 1958 the ‘polar amplification’ idea is looking a little tatty too. It is hard not to make the comparison between the inflated promises of the emerging green economy and the heady prophecies of Nonqawuse, the Xhosa prophetess. She assured the community that if they slaughtered their cattle (economy) and burned their crops (ethanol) heavenly warriors (green jihadists) would rise out of the oceans (endless renewables) and drive the White Man (CO2) out of their lands (atmosphere). They just had to believe. It was in 1857. On the appointed day they killed and burned, and the sun rose, and they starved. They have still not recovered. The terraced fields near Nonqawuse’s pool can still be seen, overgrown and abandoned. One does not have to add a pennyweight to the burden being placed on the shoulders of the next generation by legitimizing the foretellings of AR5. But do keep your eye on the trophospheric sore spot. It is key and they know it, and it is not there. Introducing #337! I doubt they’ll let me through, though, since I stated my expertise as editorial, not scientific (true story). We’ll see how that goes. I think that WUWT has lost its way just recently with some of the articles it has published, and I think this may be the worst one. When others see how WUWT is behaving in encouraging carpet bombing of the AR5 process by suggesting that sceptical bloggers register as expert reviewers, they will say that our side is behaving extremely irresponsibly in attempting to subvert the workings of a “highly professional United Nations body.” By all means, encourage real experts to register, such as Anthony, but please not your average Joe Blogger. It will only backfire on us. I know that we all think that we would make expert reviewers, but the world will not see it that way. Likewise, the article the other day, “Replication of Lewandowsky Survey” is also somewhat petty and could also backfire. Commenters from the other side could say that it was not conducted professionally and did not replicate all the detail of the Lewandowsky survey, but if it had followed the procedures of Lewandowsky, it would almost certainly be unprofessional. You are damned if you replicate and damned if you don’t. But the biggest risk is if the warmist side bomb this survey as would be sceptics and confirm the Lewandowsky results. WUWT and the sceptical community would indeed have egg on their face. On the other side, with all the negative publicity attached to the Lewandowsky report, surely it can be argued that the WUWT readership has effectively been pre warned not to make wild statements concerning the authenticity of the moon landings when filling in the survey. That alone completely destroys the point of this alternative survey and makes it little more than a bit of titillation for the readership. There have been other articles which I would rather not mention here as I would not wish to upset our host who has been generally doing an exceptional job, nor would I wish to get on the wrong side of Willis again and would encourage him to continue producing these quirky little tidbits in his inimitable style. What we should be continuing to do is to concentrate on exposing all the flaws from the AGW community, ridiculing their claims, especially from their disciples and exposing all the corruption associated with the movement and not to allow their side the same opportunities by producing articles like this one. Colin says that this post is “encouraging carpet bombing of the AR5 process by suggesting that sceptical bloggers register as expert reviewers.” That is a non-sequitur. Skeptical bloggers CAN be expert reviewers. I am indeed an expert on the omitted variable fraud that is the very backbone of AR5. Encouraging other people to review AR5 in their areas of expertise is most certainly NOT a call for “carpet bombing” with un-expert views. Colin’s premise seems to be that people who are not credentialed climate scientists cannot have relevant expertise, which is absurd. What grounds does he have to cast aspersions on any of the six people above who have gone to the trouble of applying to be expert reviewers, signing up to put their names and reputations on the line in comments that will be part of the public record henceforth? I’m sure there are dozens more WUWT commenters who could easily qualify by any standard as having relevant expertise to review AR5. How about a little respect? Doesn’t the IPCC write the summary first? How does the process work? I was confirmed as #393, but does that mean I get to review the draft? or does only a subset of the entire pool of volunteers will be nominated to review the report? #389 ready for duty. Not sure I’ll be let-in; my publications are in applied sciences relating to long-term weathering of architectural construction materials in urban micro-climates. In response to your comments on my comment, firstly, may I congratulate you on your article on “Omitted variable fraud.” It is an excellent article, which I agree with whole heartedly. The quality of your article demonstrates your abilities as an expert reviewer and I wish you well in your efforts in that respect. However, the fact that you are accusing these people of fraud will probably mean that you will be completely ignored, as will those bloggers who you have spurred on to serve as expert reviewers also. I don’t know these people and I certainly was not casting aspersions on their climate credentials. But Richard S Courtney makes an excellent point when he says that he was ignored as an invited expert reviewer except for his contribution in swelling the numbers of expert reviewers. So the amateur blogger, no matter what his expertise, is most certainly going to be ignored, except by the alarmist media who will call their contribution an interference in the process. I would suggest that you would have much greater success by plugging your “Varied omitted fraud” accusations to our politicians and others and to bring into question the IPCC’s own credentials as the keepers of the science. As I have made two contributions to this thread, that now presumably qualifies me as an expert reviewer, but I shall not be putting my name forward to the IPCC. Andrejs: The confirmation numbers are just confirmations of having applied. If they accept you as an expert reviewer they will let you know (not sure when) and send you a password (on October 5th). The misbehavior is not with WUWT. Check out the site registration requirements. This is a classic cherry picking exercise. To apply, one has to have 5 published papers. Thus folks are screened not only on the title of their published work, but also by which publication stuck its neck out (or not). So Mr. Porter, have no worries, even the most published participants on this site would never pass the star-room review of acceptable credentials. The criteria for which is of course is never disclosed. Take your anxiety elsewhere. There are no problems here. AR5 remains in well paid hands. You can go back to sleep. …Likewise, the article the other day, “Replication of Lewandowsky Survey” is also somewhat petty and could also backfire. Commenters from the other side could say that it was not conducted professionally and did not replicate all the detail of the Lewandowsky survey, but if it had followed the procedures of Lewandowsky, it would almost certainly be unprofessional. You are damned if you replicate and damned if you don’t. I neglected the rest of your comment, sorry. Had you taken the survey you would have noticed the contradictory compound questions that asked for a single response. You would also have noticed the clever way that questions were crafted so that any refined answer didn’t count. The survey wasn’t worth the TP upon which it was conceived. Again, Mr Porter, please resume your sleep. Policy Guy, to be an AR5 WGI expert reviewer you needn’t have 5 published papers. In fact, you needn’t have any, if you can demonstrate your expertise in some other way. The form has space for listing 5 published papers, but you needn’t fill them in.